Birmingham-based Rosie Kay Dance Company has become a tour de force on the British dance scene after winning a national award. It was set up by choreographer Rosie Kay in 2004, who has become a renowned leading choreographer in dance, film and theatre. Kay's work has caught the attention for being bold and innovative, but also as it isn't afraid to tackle political, challenging and taboo subjects. The company even celebrated being named Best Independent Company at the Critics' Circle National Dance Awards 2015. 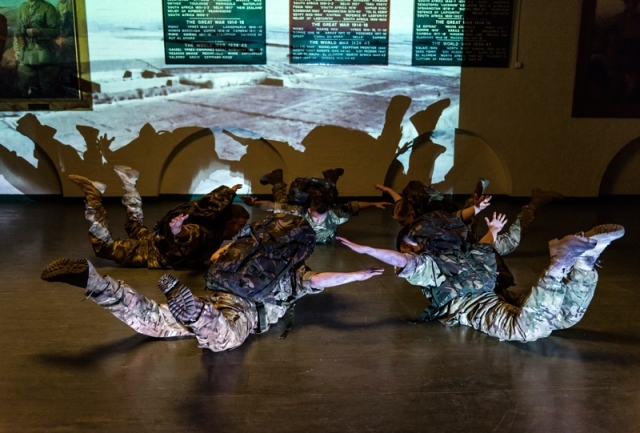 Kay's dance productions have examined issues from the effect of war on the body and mind of the military (in 5 Soldiers: The Body Is The Frontline) to work about refugees (in Asylum). After its success, Rosie Kay Dance Company is looking at another controversial topic of mind control, conspiracies, the illuminati and fake news in its latest production MK ULTRA. Rosie Kay, whose dance company is based in Northfield, answers a Q&A on her latest work and her thoughts on the future of dance in the city ahead of MK Ultra's UK tour. How do you envisage dance and the arts in regions like Birmingham in coming years of cuts and do you think Brexit will affect it? Birmingham has a really exciting and thriving dance ecology, and I'm really proud to be part of it, alongside organisations such as DanceXchange, Birmingham Royal Ballet, Birmingham Dance Network, Birmingham Hippodrome, The REP, mac and a collection of very talented artists making really interesting work. We have to support one another and we have to make work that gets noticed. I think like everyone, I don't know how Brexit will affect the UK- it's still early days. Generally, your dance company has benefited from Arts Council grants but do you worry about cuts to arts funding nationally? We've always been a very entrepreneurial company, around half our company income is from other sources- so from commercial projects as well as other grants and individual giving. We are project funded, so I never, ever get complacent or take any funding for granted. We are lucky to live in a country that does support the arts, and we've proven that arts contribute to the GDP enormously as well as having other qualities that are non-financial but have huge health and well-being benefits. We have to keep making our case and proving that the arts are relevant and important. It's also our job to keep questioning the status quo and to ask difficult questions through our work. For MK Ultra, you have collaborated with Adam Curtis and Gary Card, who designed for Lady GaGa - what do each of them bring to the production? Adam puts a political context into the show. The subject matter is quite strange- under 25 year olds will know exactly what I am referring to in the new work, but over 25 year olds might be aware, but only on the periphery. They might not know how wide-spread the proliferation of the 'illuminati' symbolism is in mainstream pop culture, and they might not know how many people are aware of the conspiracy theories. So Adam's work tells us about the theories and what's behind them. He weaves in interviews we conducted with young people, including some footage of the real doctors and CIA directors involved in MK Ultra between 1950 and 1970, and gives a political slant about what these beliefs mean in our modern times. Gary has taken all the ideas of the show, and created these incredible costumes that embody a lot of the ideas, imagery and meaning in the work, and has made these astonishing catsuits / bodysuits, that all seven dancers wear. I'm totally blown away by how he's taken all the concepts and found a style and look for the show that is totally now and totally right. How did this come about? Did you approach them and after seeing their work or a chance meeting or something else? I met Gary through my husband, Louis Price (set and video designer for MK ULTRA) and in fact Gary was best man at our wedding a few years ago! I've always wanted to work with Gary, but I didn't have the right project to approach him about until now. I know he's really busy, travelling the world with fashion work, but when I explained the concept and story he loved it so much he said he wanted to be part of it. It's great, because Gary trained in theatre and costume design, so it's wonderful to see how his fashion eye translates onto stage. MK ULTRA marks Gary's first design for contemporary dance. I was introduced to Adam Curtis through The Observer critic Luke Jennings. I approached him first of all to just talk about this conspiracy theory I had found and how I was using it to make a show. It was hard to find anyone serious who understood what I was doing and what my research was telling me. Adam and I got on very well, and so I asked him if he wanted to be involved. He convinced me that a bit of explanation about what's real, what's not, and how these theories became so prevalent was really important. I love working with him, as he is very challenging and that has been very exciting for me. Was there a particular conspiracy or event that prompted you to do this production? The conspiracy theory I'm focussed on is one that involves MK Ultra brainwashing and pop stars. MK Ultra was a real CIA sponsored experimental psychology project, using LSD, induced coma's and sensory deprivation to try to wipe people's minds and using forced images, and recorded messages, re-programme them. This was stopped in the 1970's and many people were paid compensation. The theory is that this brainwashing programme continued, and the CIA joined forces with Disney and started experimenting on children in order to create the perfect pop star. These pop stars could be manipulated and used like puppets to spread a dark agenda through the mainstream media. The first star that this really worked on was Britney Spears. But there is a twist- the programming doesn't work very well, and the pop star starts to break free from their programming, hence the so called 'breakdowns' and forced 'rehabilitations'. I'm seeing this theory as a message about our times- perhaps we've been under some kind of brainwashing, living in a bubble, but now the brainwashing is starting to fall apart and we are waking up to a 'new world order'. Are you surprised by how relevant it has become in light of the fake news controversy? Well, yes and no. About 6 months ago I was still getting snorts of derision when I told people what my show was about. I knew young people got it, and I was really struck by how young people had stopped believing in the news and were doing their own research about reality. So in a way, I saw this coming. I've found it a lot easier recently for people to understand what my show is about now, since the 'fake new and alternative facts' stuff has come out. This is about belief systems and how it doesn't matter what is real and what is not - it seems to be more about what people feel. What effect do you think fake news has on society and what would you do to combat it? Well, all the media is to blame isn't it? We've got to this point because people have stopped believing the stories we are told by our leaders. I think we've lost faith in the system. This creates a vacuum for a clever politician, like Trump, to come in, use this distrust and sow more fear and offer simplified, authoritarian solutions. There is an over simplification in the media, and a focus on headlines. We need to see through this and find out what's actually going on. Is this production making a political statement? What are you hoping audiences will take away from the performance and the choreography? Well, first of all it's a fantastic work of art, that subverts the mainstream, and it's got incredible dancing and performances. I want this to be slick, high energy and very entertaining. But through this I also weave ideas about identity, about fame, about how we dehumanise people, and ultimately, how we are all complicit in the way the world is right now. What is the last dance production that really surprised you and why? I saw two fantastic works just a week ago- I saw Danza Contemporanea De Cuba at Nottingham Theatre Royal and Matthew Bourne's Early Adventures at Warwick Arts Centre. I was really inspired by how beautiful and versatile the young dancers were from Cuba, and I was struck by the humour, wit and invention in Matthew Bourne's early works. I've got to say- I love watching good dance!